2011 ends on a high note for “Market Monetarism” and “NGDP Targeting”. The last quarter of the year has been especially exiting. NGDP (level) Targeting was “endorsed” by Krugman, Christina Romer and Goldman Sachs, among other “luminaries”. During the period several important media like the Economist and The Washington Post wrote up on the topic. At the very end of the year Ezra Klein gave out a “wonk award” to Scott Sumner for his blogging on NGDPT and the Economist had a long piece where Market Monetarism figures prominently. I was fortunate and honored to host a guest post by Lars Christensen back in September in which the name “Market Monetarism” was introduced (and stuck). In part based on the success of that post Lars decided to become a blogger, with more of a focus on Europe. I would like to mention three of my commenter’s: Benjamin Cole for his wide participation in the realm of blogs and unwavering tenacity. Catherine Johnson, far removed from economics, is extremely interested and has linked to MM in her blog, and Rafael, the only Brazilian regular of my blog (which he found through Scott Sumner) who has written and published the first MM (Regras de política monetária em um ambiente recessivo) paper in Portuguese. I must also mention David Levey, a former managing director, sovereign ratings, from Moody´s who never misses e-mailing interesting material dealing with MM or NGDPT, and Doug Irwin who is square in the camp of MM and has written great papers. I single out his recent paper on Gustav Cassel, arguably a forerunner of MM. To all, an enjoyable and productive 2012. Central bank of the year: Sweden’s Riksbank. It’s hard to avoid noticing that Sweden has dodged the economic woes that are ailing most of the world. Part of the credit here goes to deputy governor Lars Svensson, who spearheaded Sweden’s extremely aggressive monetary policy. In 2009, the Riksbank — Sweden’s central bank — was the first bank to experiment with a negative interest rate. And it had assets on its balance sheet equal to a stunning 25 percent of GDP, a sign of how much cash it was injecting into the economy, compared with just 15 percent for the Federal Reserve. The bold moves worked: Sweden has been growing at a decent clip. Central bank dissenter of the year: Charles Evans. While some on the Federal Reserve’s board of governors are worried that the central bank is doing too much and risking inflation, Evans has argued that the Fed isn’t doing enough to boost the economy. The president of the Federal Reserve Bank of Chicago, Evans is one of the few bankers who seems to recognize that 9 percent unemployment should, as he put it, set policymakers’ hair on fire as much as a slight uptick in inflation usually does. Most influential-yet-obscure economic blogger: Scott Sumner. Be honest, how many people had even heard of Nominal GDP level targeting before this year? No one. But as the economy stagnated, and policymakers seemed increasingly incapable of mitigating the pain, many analysts started reading Sumner’s blog with interest. So far, the Federal Reserve has rejected his idea for NGDP target—under which the Fed would essentially target a combination of real output plus inflation rather than focus on curbing inflation alone—but the notion has attracted support from everyone from Paul Krugman to Tyler Cowen to Goldman Sachs. And much of that has to do with Sumner’s near-monomaniacal focus on the topic. Yes Scott, it was well deserved! There have been a lot of shockingly bad performances among macroeconomists in this crisis; but if I had to pick the one that is most startling, it is the way freshwater economists have demonstrated that they don’t understand one of their own doctrines, that of Ricardian equivalence. Ricardian equivalence says that what determines consumption is the lifetime present value of after-tax income, and hence that, say, a temporary tax cut won’t stimulate spending, because people will figure that whatever they gain now will be offset by higher taxes later. It is a dubious doctrine even done right; many people are liquidity constrained, and very few people have the knowledge or inclination to estimate the impact of current government budgets on their lifetime tax liability. The boom, not the slump, is the right time for austerity at the Treasury.” So declared John Maynard Keynes in 1937, even as F.D.R. was about to prove him right by trying to balance the budget too soon, sending the United States economy — which had been steadily recovering up to that point — into a severe recession. Slashing government spending in a depressed economy depresses the economy further; austerity should wait until a strong recovery is well under way. Why is Krugman so obsessed with fiscal stimulus? Maybe because he has “decreed” monetary policy to be ineffective since the economy is, according to him, in a liquidity trap. But, although Krugman does not mention because it would “spoil” his story, much more relevant to the 1937 drop in output than the tightening of fiscal policy was the Fed´s decision to increase required reserves and the Treasury´s decision to sterilize gold inflows, with the effect of both policies being a significant tightening of monetary policy. In April 1938 when those decisions were reversed economic activity rebounded strongly. 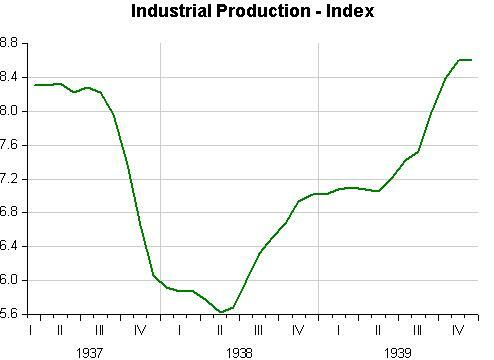 The chart below shows the behavior of industrial production. From his perch on America’s periphery, Mr Mosler champions a doctrine on the edge of economics: neo-chartalism, sometimes called “Modern Monetary Theory”. The neo-chartalists believe that because paper currency is a creature of the state, governments enjoy more financial freedom than they recognise. The fiscal authorities are free to spend whatever is required to revive their economies and restore employment. They can spend without first collecting taxes; they can borrow without fear of default. Budget-makers need not cower before the bond-market vigilantes. In fact, they need not bother with bond markets at all. The neo-chartalists are not the only people telling governments mired in the aftermath of the global financial crisis that they could make things better if they would shed old inhibitions. “Market monetarists” favour more audacity in the monetary realm. Tight money caused America’s Great Recession, they argue, and easy money can end it. They do not think the federal government can or should rescue the economy, because they believe the Federal Reserve can. The “Austrian” school of economics, which traces its roots to 19th-century Vienna, is more sternly pre-Freudian: more inhibition, not less, is its prescription. Its adherents believe that part of the economy’s suffering is necessary, an inevitable consequence of past excesses. They do not think the Federal Reserve can rescue the economy. They seek instead to rescue the economy from the Fed. Economics, perhaps more than any other discipline, has taken to blogs with gusto. Mainstream figures such as Paul Krugman and Greg Mankiw have commanded large online audiences for years, audiences which include many of their peers. But the crisis has made the academic establishment fractious and vulnerable. Highly credentialed economists now publicly mock each other’s ignorance and foolishness. That has created an opening for the less decorated members of the guild, and the truly peripheral. The clearest example of the power of blogging as a way of getting fringe ideas noticed is “The Money Illusion”, a blog by Scott Sumner of Bentley University, in Waltham, Massachusetts. In the wake of the financial crisis Mr Sumner, a proponent of market monetarism, felt he had something to say, but no great hope of being heard. “Austrians” have been around for ages, “Neo Chartalists” sound too much like “charlatans”. I´ll bet on “Market Monetarism” as the new “influential idea”. Germany has adamantly opposed what it sees as rewarding the bad behavior of southern rim countries like Italy, Greece, Spain and Portugal, which amassed high public debts and where tax evasion is rampant. But it has also been vehemently opposed to changes that many economists and the Obama administration say are necessary to ensure the stability of the euro, such as allowing the European Central Bank to become a lender of last resort like the Federal Reserve in the United States. 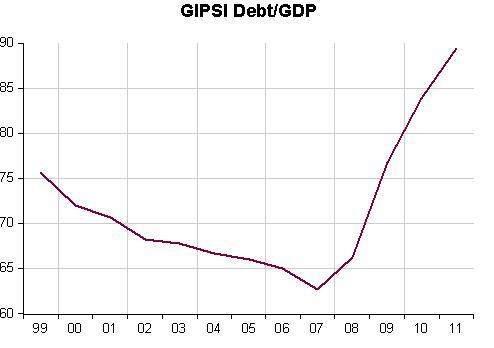 First a picture of the debt-GDP ratio weighted by the GIPSI (Greece, Ireland, Portugal, Spain) GDP shows that the public debt ratio was coming down until the crisis erupted. The real problem was systemic, associated with the single currency and the imbalances it brought about. 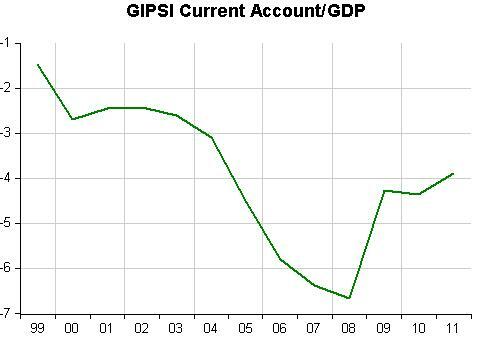 The next chart shows the current account GDP balance for the GIPSI group of countries decreased significantly since the single currency was introduced. But it´s not in Germany´s interest to recognize that fact since it would make it part of the problem! What´s there to “cheer” about? U.S. inflation is slowing after a surge early in the year. This is good news for Americans, as it means the money in their pockets goes further. It also is welcome at the Federal Reserve, which has been counting on an inflation slowdown. It gives the Fed some maneuvering room in 2012 if central-bank officials want to take steps to bolster economic growth. But what does it tell you? Not much. Headline inflation fell then rose and appears to be coming down again. Core inflation was 1.7% a year ago and for the past few months has remained at that level after having dropped to 1% late in 2010 and early 2011. 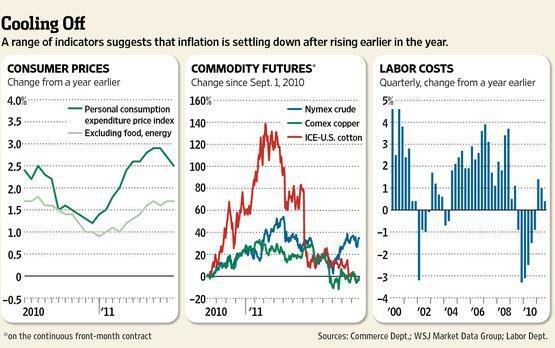 Commodity prices have climbed and fallen while labor costs have been mostly negative. But when you look at real growth what you see is discouraging. The “final” release for the third quarter annualized growth was 1.8%, way below the preliminary estimate of 2.5% given in October. Nominal GDP growth came in at 4.4%, revised down from 5.0% in the preliminary estimate. The charts below give alternative measures of the nominal spending shortfall. The first is based on the trend between 1987 and 1997. 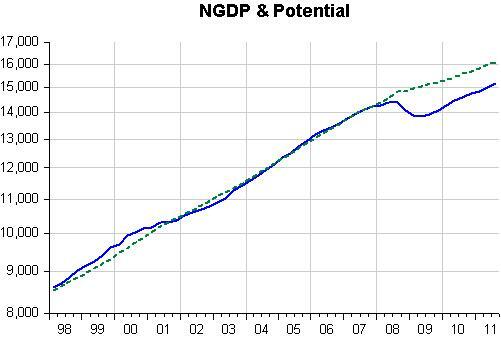 The second on the estimate of potential Nominal GDP estimated by the BEA which shows a marked decrease in potential NGDP since mid 2008, with potential NGDP growth having dropped from 5.5% in the period from 1987 to early 2008 to 3.1% since. Coincidentally, trend growth between 1987 and 1997 was also estimated at 5.5%! In any case, even if potential growth has fallen over the last three years, the shortfall (or gap) is still significant (6%). So yes, the economy remains depressed and some are “relieved” that inflation is not “taking off”! And when a famous economist like John Cochrane lets his “beliefs” (as in “religious beliefs”) intervene in his economic analysis, a philosopher is able to criticize and do a much better piece of, you know, economic analysis. Try this mode of argument on for size. If water made agriculture possible, then the Pacific Ocean would be the breadbasket of the earth. Or: If flooding is a problem, then the Sahara Desert would be the best place to live. Right? Via Brad DeLong, there’s a paper by David Romer (pdf) summarizing recent research on fiscal policy, inspired by the crisis and aftermath. And his conclusion is not at all what you hear on the talk shows; it is that there is now overwhelming evidence that fiscal policy does in fact work when it’s not offset by monetary policy. And since we’re now in a liquidity trap in which conventional monetary policy has no traction, that’s the world we’re in. Yes, and the financial markets tell us that the economy is not in a liquidity trap, every time they respond strongly to hints of Fed stimulus (QE2, etc.) But the press thinks we are. And the “clash of beliefs” that´s going on has been greatly responsible for keeping the economy down! To step back to the hyperinflation. You might ask yourself how things could possibly have gotten that bad. And the answer really just comes down to refusal to admit that a mistake had been made. To halt the inflation, the Reichsbank would have to stop printing money. But once the inflation had gotten too high for Reichsbank President Rudolf Havenstein to stop printing money and stop the inflation would be an implicit admission that the whole thing had been his fault in the first place and he should have done it earlier. It was easier to say that hyperinflation was a necessary consequence of allied demands for reparations payments and that he had no choice but to print currency in the quantity demanded. So I decided to describe the process in charts. 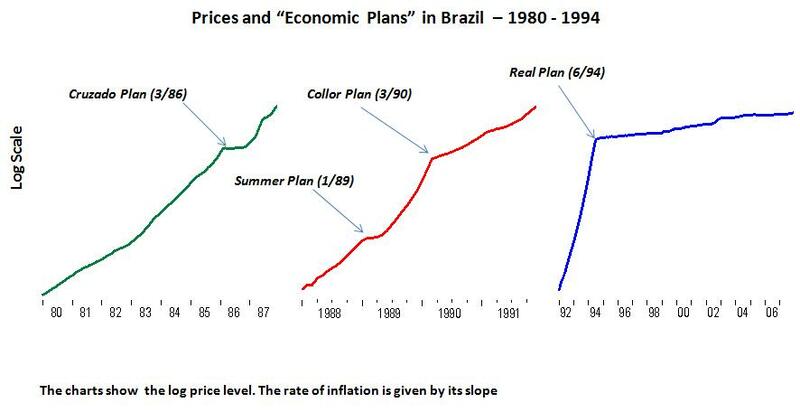 The set of charts below illustrate the path of the (log) price level in Brazil. Before inflation was finally tamed in mid 1994, several “stabilization plans” usually based on price freezes were enacted. Notice that the effect of the “policy” was longest after the first plan in 1983, becoming progressively shorter. That satisfies the definition of “crazy”: Someone who does the same thing over and over and each time expects a different result. 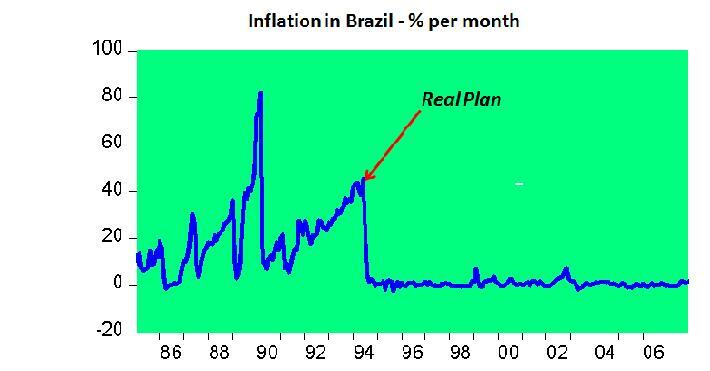 In the Collor Plan they “innovated” and confiscated 80% of everyone´s liquid assets! The result was a kink in the slope of prices, meaning the rate of inflation decreased somewhat. But in 1994 when the Central Bank decided enough was enough, inflation immediately “disappeared” as if by “magic”. The chart below graphs the rate of monthly inflation over the same period. 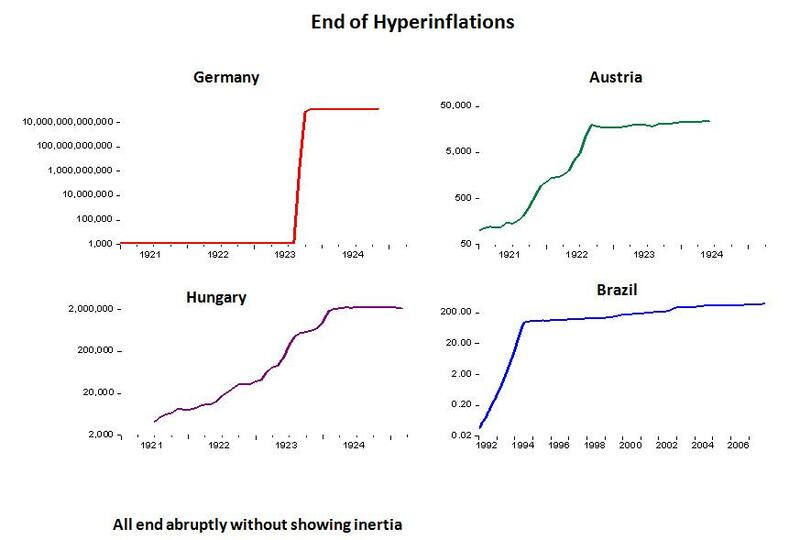 The charts below illustrate the same pattern for famous hyperinflation episodes (some of those are discussed by Thomas Sargent in “The End of four big inflations”). The pattern is clear: When the monetary authority sets its mind to do it, inflation stops immediately. 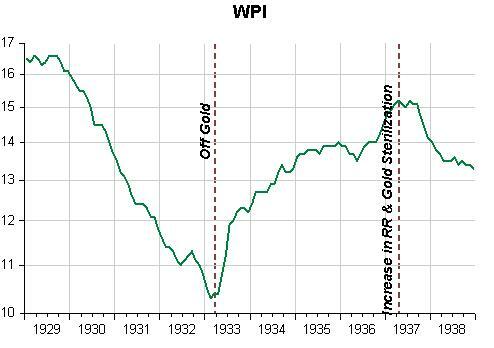 The chart below shows that: 1) The change in MP quickly reversed the deflation that went on from 1929 to early 1933 and, 2) The reversal in MP quickly brought deflation back in mid 1937! So Iglesias conclusion is consistent with the data. If the Central Bank makes a mistake it will keep making it, unless you change the “actors” in the process. They are terrified of being “blamed”. The Fed was very successful at bailing out large financial institutions. 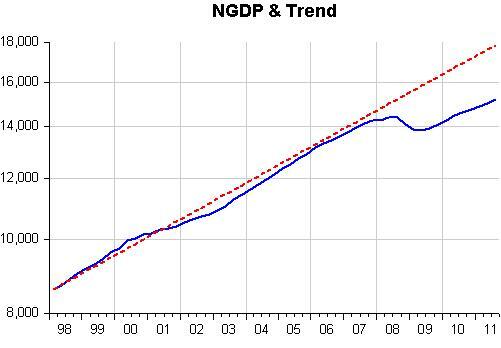 It was a failure at maintaining nominal GDP growth. You would think that this would make the Fed highly vulnerable politically. However, the political right protects the Fed by raising false alarms about inflation, thereby arguing for monetary policy to be tighter, not looser. And the political left protects the Fed by insisting that things would have been much worse without the bank bailouts and by insisting that we are in a liquidity trap. As you know, I do not buy into textbook macro. But textbook macro has a nonzero probability of being correct, and if it is then the Fed ought to set an aggressive target for the level of nominal GDP and do whatever it takes to hit that target. Put these four factors together, and you can explain why the year ends much worse than it started. Is all hope lost? No, but putting the recovery back on track will be harder than it was a year ago. It will take credible but realistic fiscal consolidation plans. It will take liquidity provision to avoid multiple equilibria. It will take plans that are not only announced, but implemented. And it will take much more effective collaboration among all involved. I am hopeful it will happen. The alternative is just too unattractive. I wonder if his slip has anything to do with the position of the ECB on being a LOLR.